A link to an nice article by Stephen Heard about riding the Queenstown Trail with Around The Basin, enjoy! 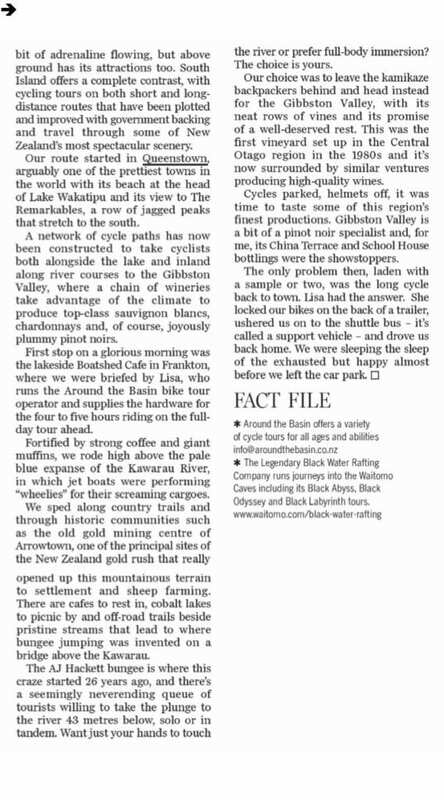 A great review of our Bike The Wineries Full Day Tour by Irish Kiwi! This girl moved to Queenstown and has been loving it! Click the below link for more! Around the Basin is proud to have a strong affiliation with Ziptrek Ecotours. We offer zip and ride packages which allow visitors to experience two of Queenstown’s most sustainable tourism activities. Fly through the trees on the Ziptrek and zoom along the trails from Arrowtown through to the Gibbston Wine Valley on your hired mountain bike, what a way to spend a day. Check out this great article about Ziptrek and their sustainable approach to tourism in Queenstown – Sustainability at heart for high flyers. If you wish to book a Zip and Ride package, please see our Combo Activities page – Combo Activities. The Queenstown Marathon, Half Marathon and 10km Run held annually on our very own Queenstown Trails. This article was written by Rob McFarland for the Sydney Herald after he competed in the Half Marathon and then came out riding the Arrow River Trail with us. From bike trails to wine trails and everything in between… meet the new 110+ kilometres long Queenstown Bike Trail. The trail, one of the great rides of the New Zealand Cycleway project, was officially opened by New Zealand Prime Minister, John Key on the 18th October 2012. The new trail is made up of existing and new trails looping around the Queenstown region. Highlights of the trail include wineries and cafes, lakeside trails, riverside trails, swing bridges and historic bridges, historic buildings, mountain views and picnic spots all with Queenstown and Arrowtown as the hub. We tagged along with a one of the local bike tour operators on a semi-guided day trip to experience some of the best the new trail has to offer.